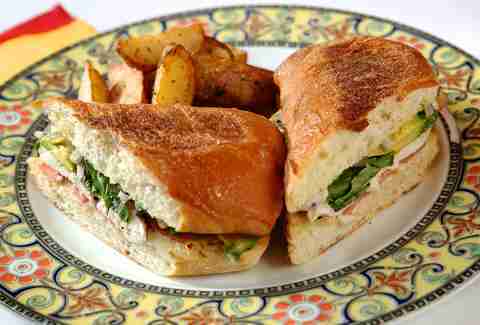 There's no better culinary canvas to display Chicago's world-class range of cuisines than the sandwich. Naturally, we lean toward the meatiest and cheesiest of bread-toppers, but we’re not limited to just carbo-loading on Italian beef sandwiches alone. We’ve culled 21 of the most craveable sandwich styles from around the world, found right here in Chicago, and sorted them by country/region. What is it? The traditional Argentine choripán -- a combination of two words: chorizo (sausage) and pan (bread)-- is most recognized as a street food or appetizer. Often prepared with pork and flavored with pimento, smoked red peppers, garlic, and red wine, the chorizo is then split down the middle hot off the grill, and served on a roll similar to a French baguette. It's also customary to add sauces like chimichurri, a vinaigrette-style sauce with parsley, garlic, olive oil, red-wine vinegar, and red pepper flakes. The Argentinian-style cocktail lounge/restaurant from the Tango Sur team has mojitos and pisco sours, dancing to live Latin music and DJs, and edibles like the choripán, prepared with homemade sausage and red onions on a crusty, crisp bread to soak up the meat juices and chimichurri sauce. Just keep an eye out for the ñ (pronounced EN-yay) sign on the industrial stretch of North Elston. What is it? Embraced by many Aussies since birth, Vegemite sandwiches are as ubiquitous as American peanut butter and jelly sandwiches. The dark brown food paste produced from leftover brewer's yeast extract with various vegetable and spice additives is commonly spread thinly on buttered toast and sandwiches. A fingerful of B vitamin-packed Vegemite can be described as a meaty, salty punch in the face. Needless to say, it's an acquired taste. You probably won't find the salty, malty, beefy paste spread on sandwiches too often in US restaurants, but Scofflaw recently prepared a version of a Vegemite sandwich. New chef Sue Litz, who'd just taken over for Mickey Neely, created a cheese toastie with Vegemite, tomato, avocado, and caramelized onion on sourdough. Since it's off the menu now, let Hugh Jackman be your guide on how to really eat the stuff. What is it? Eating Brazil’s most prized cut of beef, "picanha," gets even better when served with caramelized onions and an ungodly amount of melted mozzarella cheese on lightly toasted French bread. Tucked away on Oak Park Ave, this humble restaurant dishes up authentic Brazilian food and it's BYOB. 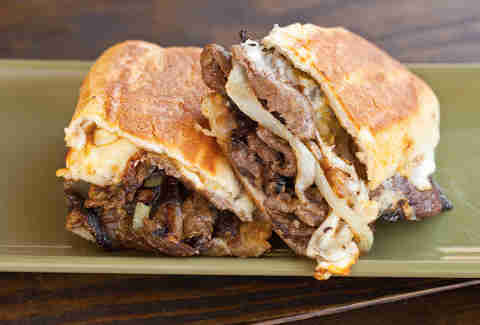 Here you'll find the mighty picanha sandwich, which is piled high with well-seasoned, relatively thin-sliced tender steak, and is then smothered in caramelized onions and loaded in melty mozzarella goodness on a warm French roll. What is it? A deep-fried, flat flour shelled pancake that looks more like a thin pizza, but becomes a giant flatbread sandwich when cut open and filled with roasted or smoked pork (or Peking duck) and scallions. This no-frills Chinese spot in Bridgeport serves dumplings and traditional fare, plus less-familiar dishes. The chefs open up the delicate, crispy scallion pancakes and stuff the pockets with thinly sliced pork, then add plum sauce and onions for incredible flatbread sandwiches. What is it? A Costa Rican classic with ribeye steak or chicken, sautéed onions, beans, melted cheese, and Lizano sauce on French bread. 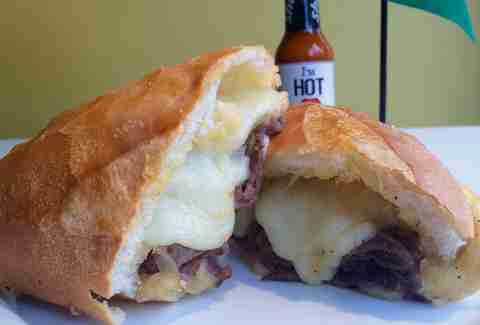 Billed a "Chicago favorite," this Costa Rican joint's pepito is bursting with flavor. 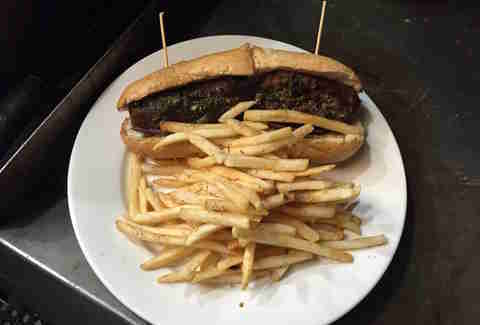 The mouth-watering sandwich boasts ribeye steak (or chicken), sautéed onions, seasoned black beans, and gooey Muenster cheese between slabs of freshly baked French bread -- all topped with Lizano sauce, a traditional brown sauce made from vegetables and spices. Add hot peppers or avocado for an extra 50 cents each (and you should) and pair it with plantains and an oatmeal shake for an exceptional outdoor patio experience. What is it? A classic Cuban sandwich combining roasted pork, glazed ham, Swiss cheese, pickles, yellow mustard, and bookended by griddled bread. This restaurant's Cuban mainstay features pork shoulder that's been marinated and roasted in-house (you'll even find them roasting pigs outside the Logan Square store in the summer). Then they pile on the slow-roasted ham, Swiss cheese, dill pickles, and yellow mustard between hearty slices of a buttered baguette, marrying the flavors together as it's smashed in a panini press. What is it? Originating as a quick snack in French cafés and bars, the baked or fried boiled ham and cheese sandwich can be prepared a few ways. It's usually made with slightly sugared Brioche-like bread pieces, or normal butter bread with a soft crust, and topped with grated cheese and béchamel sauce. 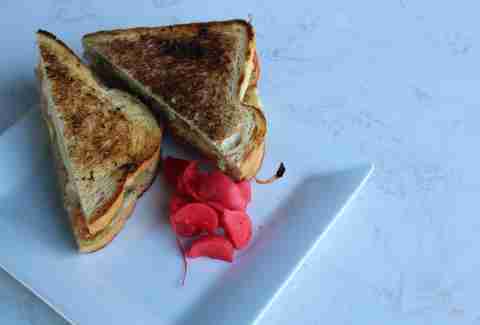 The entire sandwich is baked in the oven, pan-fried, or grilled in a specialized horizontal grill, so the top of the cheese melts over the bread's edges. This neighborhood bistro prepares the iconic Parisian "snack," which is really more of a feast loaded with French ham and oozing, rich Gruyère cheese, for mimosa-filled brunches and romantic dinners. The quaint garden patio with hanging lights is the perfect setting to get your French fix. What is it? Popular in Germany, as well as the Czech Republic and Austria, schnitzel is a thin meat cutlet of pork, veal, or chicken, breaded and fried. The best schnitzel sandwich, or schnitzelwich, starts with fresh schnitzel that's hot, golden brown, and crisp all over. Then it's prime for stacking between soft bread, where caramelized onions, tomato, cheese, mayo, red pepper spreads, etc., can be added. If there's such a thing as a refined schnitzel sandwich, this River North spot has it for a heavy-hitting lunch or boozy brunch. 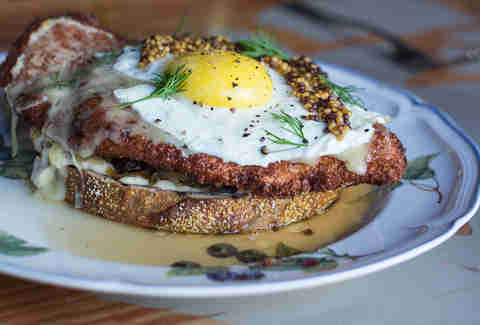 BoHo's colossal, open-faced version features pork schnitzel loaded on rye bread with horseradish cream, sauerkraut, Emmentaler cheese, and, of course, a fried egg… because, why not? What is it? Juicy, seasoned meat cooked on a slow-turning, vertical rotisserie is shaved off and served in a fluffy pita or sandwich with fresh-cut tomato and onions, and drizzled with creamy tzatziki. Some of the best gyros in the city come from Greektown, but you'll find authentic spots to get your spindle-meat fix in other 'hoods. 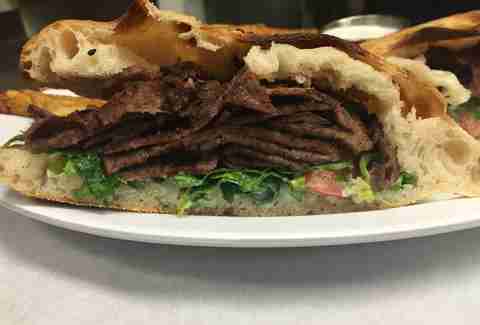 Choose from two options for a sandwich at this old-school gyro destination -- either a beef/lamb combo or chicken -- and you'll be rewarded with garlic meatiness. What is it? Soft, flaky paratha makes an ideal vessel for a variety of flavorful, slow-cooked Indian ingredients. 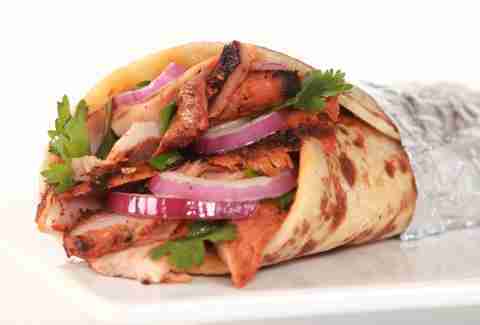 This eatery (with two base locations and a roaming food truck) makes a range of classic Indian dishes portable via a traditional flatbread wrap. Take your grilled chicken breast marinated in Tandoori spices and finished with a fresh cilantro mint chutney and tikka masala sauce to go. What is it? 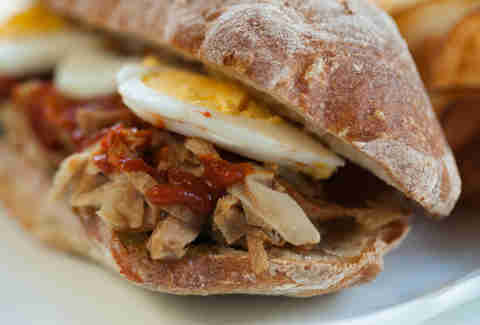 Historically a cheap, high-protein workingman's sandwich, the staple street food in Florence is a tripe-lover's dream. The sandwich requires abomasum tripe (the fourth and final portion of the cow's stomach, said to resemble the lamprey eels once abundant in the Arno River) to be slow-cooked with tomato, onion, parsley, and celery. Once it's texturized like tender roast beef, it's tucked into a crusty bun that's been dipped in the broth and topped with green parsley sauce and hot sauce. 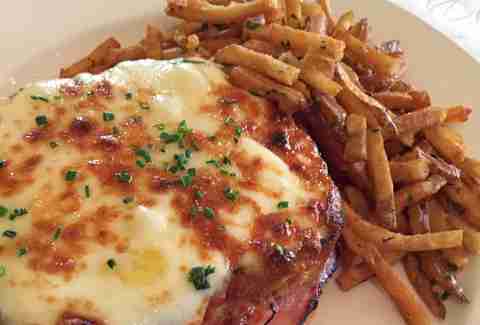 While it's not on Nonna's menu permanently, you'll find the Florentine lampredotto occasionally as a special. Chef Tony Quartaro's lampredotto sandwich entails braised tripe, a bone marrow and mint salsa verde, red pepper condiment, hard-boiled egg slices, and beef jus on toasted, crusty ciabatta bread. What is it? Traditional sandwiches hailing from Puebla, Mexico, cemitas come with a different bun and toppings than the typical Mexican torta. The sesame-topped egg bread sandwich usually has a milanesa, or breaded veal cutlet, with jalapeños, chipotle peppers, red chile sauce, sliced avocado, onion, and queso blanco. 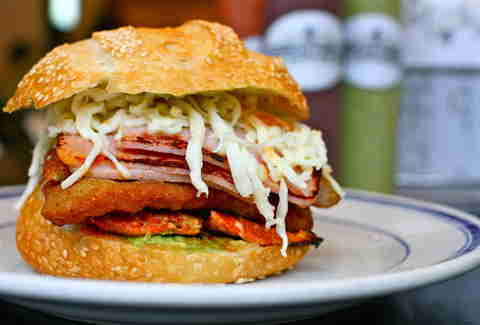 There are numerous variations, but Tony Anteliz, the owner of this family-owned sandwich shop, has experimented with the cemita. He even frequently visits Oaxaca to buy Mexican-made cheese and other goods for the quality back home. 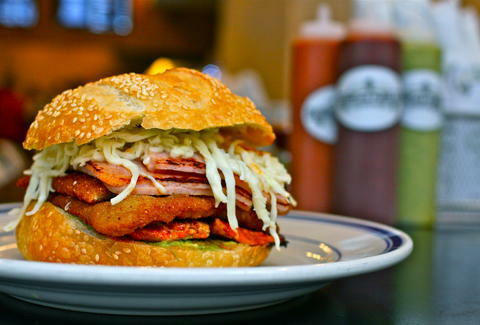 His Cemita Atomica is piled high with three meats -- Krakus ham, guajillo-rubbed pork loin, and breaded pork milanesa -- along with avocado, smoky chipotles, and Oaxacan string cheese. What is it? 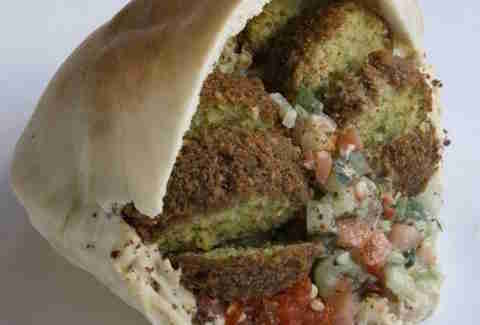 There are different theories about the origin of falafel being tucked into warm pitas. Popular all over the Middle East (and now much of the rest of the world), the pocketed deep-fried chickpea balls are piled with cucumber, tomato, and lettuce, and dripping with tahini. This fast-casual joint with mostly vegetarian eats transforms the humble chickpea for its signature dish -- the falafel sandwich is one of the best in the city. Served in a warm pita lined with hummus and stuffed with falafel, tomatoes, and Jerusalem salad topped with creamy tahini and made as spicy as you'd like, the huge portions make it a steal. This is guaranteed to be your go-to falafel spot. What is it? Popular street food in the larger cities of Poland, the open-faced sandwich (pronounced zah-peeyeh-KAHN-kah), is basically Polish pizza. Variations are endless, but zapiekanki (plural) are sliced baguettes layered with sautéed mushrooms, melted cheese, corn... and ketchup and mayo. Some are Hawaiian-style with pineapple or Greek-style with olives and feta cheese. This Polish street food snack shop just off Belmont on Central serves up a number of Polish treats we'd consider the makings of essential post-bar food. Classic and vegetarian versions of the zapiekanka on fresh bread are up for grabs. What is it? Inspired by a Puerto Rican dish, Juan "Pete" Figueroa invented the jibarito (pronounced hee-bah-ree-to) in 1996 at his Humboldt Park restaurant, Borinquen. 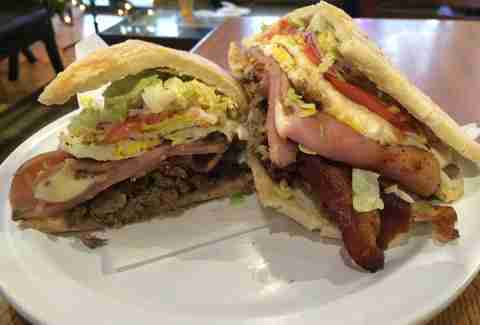 The Chicago-created sandwich swaps out bread for two planks of crisply fried, flattened green plantains, holding grilled steak (pork or chicken), lettuce, tomato, mayonnaise, and melted cheese in between. 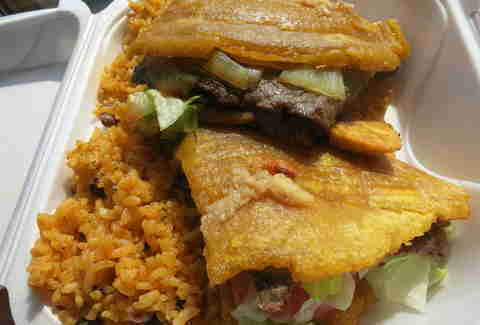 While a number of Latin American eateries have picked up the jibarito for their menus since its inception, this popular Logan Square spot features the textbook version with thin, crispy plantains strong enough to hold everything together. What is it? Ingredients can run the gamut from omelettes to cold cuts to sweets like chocolate, depending on the region of Spain, for this simple sandwich served on a crusty barra de pan (baguette). The Emilio's Tapas eatery Downtown offers a selection of deliciosos bocadillos for lunch: bocadillo de pollo y chorizo (grilled chicken breast and Spanish sausage with avocado, red onion arugula, and cumin mayonnaise), bocadillo de cebón (grilled steak with cabrales cheese and cava vinaigrette), and bocadillo de pescado (grilled fish with fresh basil, red onion, and tomato). What is it? Named after a fishing port in the northernmost tip of Denmark, toast Skagen was created by a Swedish restaurateur. The exquisite combination of prawns in a mayonnaise base topped with sprigs of dill and sometimes whitefish roe on a small piece of sautéed bread is popular as a starter at Swedish dinner parties and restaurants. This neighborhood Swedish restaurant offers the real taste and experience of Scandinavia, including its open-faced toast Skagen with an Arctic shrimp salad of the day on brioche. What is it? The döner kebab (translation: "rotating roast") is vertically roasted meat (typically lamb, but also beef or chicken), sliced into thin, crisp shavings, and wrapped in lavash bread or pita with other fillings like tomato, onion with sumac, pickled cucumber, and chili. Thanks to German-Turkish immigrants conceptualizing döner as a sandwich, it's now quite possibly the most popular post-bar street food all over Europe. But you don't have to go Eurotripping to get the melt-in-your-mouth meat. This Turkish restaurant dishes up arguably the best classic Turkish food in the city on house-baked bread. What is it? This Uruguayan specialty starts with filet mignon, which is usually topped with mozzarella, tomatoes, mayo, olives, bacon, ham, and eggs on a crusty bun. Occasionally, there are other add-ons like beets, fried red peppers, sliced cucumbers, or peas. 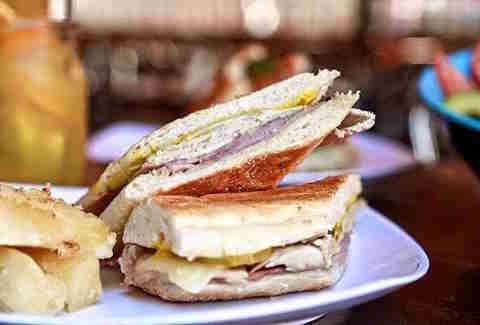 While the cafe is most known for its variety of lunchtime staple Cuban sandwiches, you'll also find the Uruguayan chivito here. The steak is marinated in a signature mojo for at least 24 hours before it's loaded onto the sandwich... before the Virginia ham, bacon, fried egg, mozzarella, lettuce, tomato, onion, and citrus mayo are piled onto the French bread. What is it? Prominent in both Venezuelan and Colombian culture, the various sized flatbreads made of ground maize dough are split to house a wide variety of ingredients, including shredded beef and cheese; chicken, avocado, and mayonnaise; and perico (often containing scrambled eggs, peppers, tomatoes, annatto, and onions). The food truck enterprise from New Orleans peddles Venezuelan cornmeal patties packed with juicy meats and cheese among its other Latin American street fare offerings. 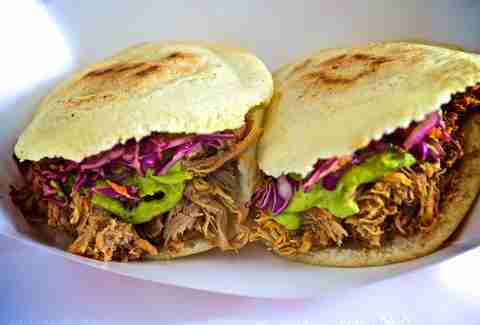 Build your own arepa rellena by picking a protein like braised pork and a zesty sauce like guasacaca (Venezuelan guacamole). Check its website calendar for its weekly location before you go. What is it? The French-Vietnamese fusion of crusty bread with fillings like pork belly or lemongrass tofu, crisp cucumber spears, pickled daikon, carrots, jalapeños, and cilantro found in Vietnamese bakeries is largely a byproduct of French colonialism. The single-serving baguette is usually more airy than its Western counterpart because of a thinner crust. By now, bánh mì is pretty much a go-to workday meal in larger American cities, and Chicago is no exception. With some of the best bánh mì hands down, this authentic bakery remains a pioneer in our fair city's Vietnamese sandwich hype. Its fresh-baked bread, accompanied by your choice of meat or tofu, pickled vegetables, jalapeños, and lots of cilantro, will have you taking advantage of the buy five, get one free special. And don't forget the Vietnamese coffee. Nicole Bruce is a contributing writer for Thrillist. She travels the world one sandwich at a time. Find her on Twitter at @nicoleabruce.